1. Andrew Lloyd Webber’s iconic The Phantom of the Opera is the longest-running Broadway show of all time. It has surpassed an incredible 10,000 performances. 2. 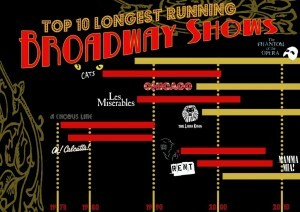 Since 1975, the list of the other shows with long show-runs on Broadway includes, A Chorus Line, Oh! Calcutta!, Les Miserables, Chicago, Rent, Mamma Mia, The Beauty and the Beast, Cats, and The Lion King. 3. In all, there are 40 Broadway theatres. Despite the title, only 4 theatres are actually located on Broadway. 4. In order to qualify for Broadway theatre status, a theatre must have 500 seats and be located between 40th St. to 54th St., and from West of 6th Ave. to East of Eighth Ave., including Times Square. 5. There were 12.4 million tickets sold for Broadway shows in 2012. 6. The Jersey Boys has won 4 Tony awards. 7. P.T Barnum produced the first Broadway show in 1870. 8. The average Broadway ticket is $95.